Callisto as counselor in THE BITTER SUITE. You can see what isn't there. And truth may be lies. Season Three of Xena: Warrior Princess (XWP) got everyone talking about symbolism and not just the subtext kind either. Tarot and "What the heck was that BITTER SUITE (58/312) thing about all about"? became much debated topics. The modern study of symbols is part of psychology. The word "psychology" itself stems from a Greek myth about a princess named Psyche with whom Cupid fell in love. Many of the terms used in psychology have Greek origins and, come to think of it, we would not even have the show XWP if it were not for the ancient Greeks. Not just because it is about some massive Macedonian and her Grecian friend, but because we would not have theatre (and it's modern antecedent, television) if the Greeks had not invented that as well. Theatre evolved from Greek religious ceremonies where, some believe, the priest or priestess would relate to the gathered masses the story of some person, say Oedipus or Pandora, in the hopes that upon hearing how these people had so miserably failed in life or been toyed with by the gods, the listeners would not repeat these mistakes. Gods were the personification of all the shades of human behavior, and they represented the various parts of our personalities. This kind of theatre was the first group therapy session. As an outgrowth of this, storytelling, in all its forms, is symbolically useful to us because it does not discern between the outside "real" world and the inner world of the psyche. Here you finally get to what this whole ramble has been leading up to: a psychological and symbolic deconstruction of Xena: Warrior Princess . Sound like a whole great big Freudian mess of fun? You have been tricked ("Ha Ha!" I say heartily, fists on hips) because it is going to be a Jungian mess of fun. Honest. I would like to say up front that I do not hold any sort of degree in psychology or a related field, and the only reason that I am attempting this (aside from being "Gabilisciously" obsessed with the show) is that it is fiction, and this is sort of analysis is what fiction is for. In real life, the human condition is much more complex. A quick primer is in order. 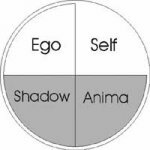 According to the disciples of Freud and Jung, the psyche is divided into parts. These parts are, roughly: Conscious (above), Unconscious (below), Masculine (left), and Feminine (right). These divisions overlap each other creating what is shown in the diagrams below. We spend most of our time in our Ego, that is to say in our conscious state and in touch with the physical world. The goal of life should be to reach the Self, the unified whole with an understanding of all aspects of our nature. The classic Sun Hero myths about Osiris, Gilgamesh, and Hercules are symbolic of the "life journey" towards this unity. First, these heroes conquer the conscious physical world, and then they each descend into the underworld of the dead and conquer their unconscious. With command over both sides of themselves, they achieve unity. The "Anima" is the personification of the feminine qualities in a man, and the "Animus" is the personification of the masculine qualities in a woman. 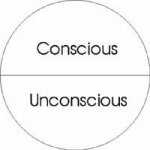 These are very powerful forces because Western culture generally teaches us to ignore or even repress them in ourselves, but, as anyone who has ever had bad dreams can tell you, the unconscious can not be ignored for long. "Und zo, vere shall ve shtart, huh? Agh! Zee-nah on zee couch first, you say. Of course". Let us start with Xena's physical attributes. She is tall, imposing, very sure of her astonishing physical abilities, and covered in leather and hard steel to keep the outside world from getting at what is inside. As a hero she has weapons. The sword is a traditional weapon of male "sun" heroes (i.e. Hercules/ Heracles), and everyone knows its phallic symbolism. Or do they? In the tarot and related symbolic systems, the sword represents the thinking or intuitive functions which discriminate and divide things. But, these are considered masculine traits, and, therefore, the sword is still phallic, even in politically correct times. (And here you were thinking it was because of its shape). 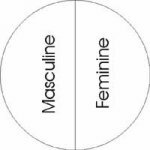 It is important to understand that symbolic "masculine" and "feminine" are used in a similar fashion to physicists describing sub-atomic particles as having color or flavor. They are just words used as handles so that we may discuss without qualifying everything. Symbolism is not a cut and dried science, and therefore we get blurry edges on things like thinking vs. intuition. Depending on the context, intuition can be masculine or feminine. Both are higher mental functions which sometimes compliment each other and, at other times, oppose. 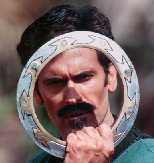 Xena, in Autolycus' body, guides the chakram. In opposition to Xena's sword is her Chakram , a yonical (the opposite of phallic) symbol carried by the Hindu god Vishnu in his aspect as the goddess Kali. In this picture we see Kali with her four hands. The first holds a conch shell (sankha), the second a chakra, the third a lotus blossom, and the forth a mace. As a circle of fire, the chakram both dispenses death and represents the cycle of rebirth and renewal. These are the main themes of Xena and the driving forces behind Xena's actions as evidenced by the translated lyrics of "The Gauntlet" from the XWP soundtrack: "Can faith be born of ashes / And grow to fight another day?" "Zo, Zee-nah, tell me vhat you remember about your fazer". "Well there was one thing. When I was young I'd stand in the field and watch my father ride his horse. He'd come so close, and I'd stand fast, not moving a muscle, and he'd gather me up in his arms and off we'd go. I thought he was the greatest man in the world" [ TIES THAT BIND (20/120)]. We are led to believe Atrus is Xena's father in TIES THAT BIND. Did she really think that though? Just a few minutes before this she said, "I don't know who you are, but my father wouldn't rescue slave girls. All he cared about was himself". There has to be an explanation for this change of attitude, and I think rescuing slave girls is a good place to start. In the first ten minutes of SINS OF THE PAST (01/101), after an attempt to literally bury her warrior past, rescue would-be slave girls is exactly what Xena does for the women of Poteidaia. She chooses to use the skills she has acquired through a life spent as a warrior, usually a male occupation, to help others. So how did she come to this masculine life? Was it simply overcompensation for growing up without a father? Let us consider what we know: the abandonment issue. Xena obviously loved her father, and he left without a trace, which must have left an indelible mark upon her. It is perhaps for the best that she did not learn the true nature of his disappearance until she was much older. Xena grew up without a father, but she did have two older brothers. This closeness in age to her male role models led her to a different sort of relationship with her Animus. The male part of her psyche, like her role models, was youthful and unrestrained, and the female aspects of her psyche were left to atrophy. She was a tomboy. Lyceus, her favorite brother, died at a pivotal moment in her life, and there was a great deal of guilt associated with this. She felt that his death was her fault, and so did her mother. Never having paid much attention to her emotions, she was ill equipped to deal with such a powerful crisis. It is much easier to place (project) the cause of your psychological distress on to someone else rather than to see it in yourself, so her mother became the problem and Xena simply walked away. Xena's psyche attempts to balance itself after this by recreating the past as she knows it. She leaves her mother, just as her father did, and assumes the role of protector of her home. After destroying anything she perceives as a threat to her home, she continues in her path of violence because she has not confronted the true problem: her feelings of betrayal - betrayal by her father who left her, by her mother who refused her comfort when she needed it most, and betrayal by herself. 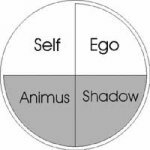 By that I mean, the defense of Amphipolis must have been Xena's first true encounter with her darker emotions, which would be represented by the "shadow" in the above diagrams of the psyche. In the defense of your own home and family, who is not capable of becoming an animal? Xena is familiar with her Animus, which gives her the logic of, "Bloody the bully's nose, and he won't be back". But when that "logic" is driven by her clumsy emotions, it becomes something quite different. Xena may have been appalled by her own skill and ruthlessness when the battle was over because she was unaware that she was capable of such things. Caesar has all the right moves in DESTINY. Her life as a pirate gives her time to consider these things. Whether the writers did it consciously or not, their choice of environment is perfect. The sea, and water in general, represents the unconscious. Xena is skimming over the surface of her unconscious. It carries her places as it tries to tell her what is wrong, and she is starting to listen as we see in the line: "This life I'm leading is beginning to bore me" [ DESTINY (36/212)]. Unfortunately she confides this to the worst possible person: Caesar. Just think of his favorite catch phrase, "Divide a woman's sensibilities from her emotions, and you have her". There can be no mistaking this symbolism. He is the force which will separate Xena's left from right, up from down, conscious from unconscious, and it is a cruel irony that Caesar does it by crucifixion. The cross is the simplest representation of the perfect human form: legs together, arms outstretched, head upright. Crucifixion is, therefore, a symbolic act that makes the deviant criminal conform to our ideal state. So there she is once again, betrayed by a powerful figure she trusted. I think most of us would agree that it is the backlash of this event that creates Xena, the Conqueror. The crucifixion is the death of her Ego, and she is now ruled wholly by her Shadow, a creature of carnal instinct who delights in making the world pay for her pain. For a time, Borias plays the role of her dead conscious. He is the focus which she lacks, the moderation which she views as weak, and, most importantly, the treaty maker. He will seek compromise and discourse when the only solution she sees is, "Kill them all! ", which is her projection of her own inner need for death. We also see this deathwish behavior in Callisto. So that is my take on who Xena was. To find out who she is we must study Gabrielle, because Gabrielle is everything that Xena was not. They represent each other's inferior functions. Like Borias, Gabrielle provides balance, only this time Xena is not fighting it. "The only reason I do any good at all in this world is because I do it with you." "Zo, Gah-bree-el, vy are you traveling vith Zee-nah?" "Wandering" would be a more accurate description of what they do than "traveling". Wandering is an aspect of "The Life Journey" that is so often used in stories. In more classical stories the Journey starts with the destination in mind, the hero has a goal to reach. In modern times, however, it is increasingly more common to find characters who wander in search of they know not what. Look at the clich� of the hitchhiker in the late 60's and early 70's as the product of a "lost" generation. "You see that guy they want me to marry? ...It's not the gentle part I have a problem with. It's the dull, stupid part." So Gabrielle has a fear of marriage or what it represents: maturity and responsibility. She has grown up in a family of three women, in an idyllic farming community (farming and agriculture are often represented by female goddesses, such as Demeter, for the obvious reasons of female fecundity and nurturing), and now Gabrielle's family expects her to get married and be a responsible member of society by making babies. Gabrielle has an overabundance of experience with her (feminine) intuitive and feeling functions, but her (masculine) thinking and sensation functions are crying out for attention. Life with Xena (sounds like something Gabrielle will write when she is sixty) would seem to be the perfect escape route. Gabrielle wants to experience firsthand the reality of those myths I was talking about earlier because she knows that she has a lot of growing to do before she is the person she wants to be. Be careful what you wish for, little girl. One of the first encounters Gabrielle has in her new life is with a Cyclops. Eyes are symbols of the conscious Ego, and so a one-eyed creature represents limited, one-track thinking, our heroines' old lives. Xena, with her primary functions of sensation and intellect, defeats this foe head on by doing battle with it. Gabrielle's primary functions are intuition and feeling. She intuitively feels what the Cyclops wants and defeats it by telling it what it wants to hear. This is something she does to herself quite a lot as well, but I will get to that later. Xena knows that Gabrielle can help her change because Gabrielle keeps altering Xena's normal pattern of behavior. "There's only one way to end this cycle of hatred, and it's through love and forgiveness." But what is Xena doing for Gabrielle's need to realize her full self? How many times have we heard Xena say, "Don't you ever change on me," to Gabrielle? Gabrielle dutifully plays her part by acting like a child. In the beginning, she was always being captured or threatened and the result was that Xena had to pay attention to her. Gabrielle discovers more about herself in DREAMWORKER. Also like a child Gabrielle shows promise and potential, and she has great possibilities locked away in her. The priests in DREAMWORKER (03/103) try to take these from her for their own purposes, but Xena stops them. In this case, that is a good thing because Gabrielle would otherwise be dead. When Gabrielle gains the Amazon Right of Caste and becomes a princess, however, she never follows through with it. Even once she becomes the Queen of Ephiny's tribe, Gabrielle chooses to stay with Xena to play out her part as Xena's inferior function. In THE PRODIGAL (18/118) when Gabrielle defends Poteidaia, she is spared the messiness of bloodshed by Meleager. She does not get the chance that Xena had to come to grips with that side of herself. As her world grows increasingly violent, she begins to think that her old life might not have been so bad. Maybe getting married and having kids is a good choice. Once again she is trying to avoid growing up, only this time the growth is the potential discovery of her true self (the completing of the quest), the possibility of seeing beyond her own idealistic veneer. Instead, in RETURN OF CALLISTO (29/205), she says, "Yes", to Perdicas' proposal. On the surface, Xena is happy for her, but her shadow does not want this change because it is not finished with Gabrielle yet. This is where fiction differs greatly from reality because in reality what I am about to say would make no sense. Xena's unconscious Shadow Function acts upon the story through Callisto. We cannot deny the nearly identical yet opposite natures of Xena and Callisto. They are separated by a thin veil that is Xena's greater age, wisdom (presumably), and the love of a few people. Callisto lashes out and kills Gabrielle's chance for a life away from Xena, and Xena is there to pick up the pieces. The fact that Xena kills Callisto (No, she did not really kill her, she just..."let" her die) represents her pushing that aspect of herself deeper into her unconscious only to have it emerge more powerful than before in INTIMATE STRANGER (31/207). "Oh, I'm not going to kill you now. First I'm going to kill your soul." GIRLS JUST WANNA HAVE FUN (28/204) was an exploration of the transfomative powers of Xena and Gabrielle's relationship. Wine (or in this case, the blood of the god of wine Bacchus/Dionysus) has long been used as a path to the unconscious. The legends of Bacchae and Maenads come from the erroneous accounts of actual ceremonies in which groups of women would worship the god of wine (i.e. get drunk and have a girls' night out that lasted three days). This was a very empowering experience for the women involved, just look at what happened to Gabrielle. She meets and dances with two "strange" women (all right you subtexters, stop smiling), and they give her the gift of self discovery. The blood of the wine god frees her unconscious, and suddenly she can fly, she is stronger, and, of course, there is the sexually extroverted nature of the vampire facade. Vampires have long been a powerful representation of the unconscious. Bram Stoker used them as symbols of sexuality in the repressed Victorian age in both Dracula and Lair Of The White Worm . Both Stoker and the production staff of Xena used the Bacchae's wolf aspect. Consciously or not, they are both drawing from the Maenad myths in which the "wild women" are described as being like a pack of wolves (a line that Gabrielle comes up with herself in A DAY IN THE LIFE [39/215]). What does Gabrielle do with this dark power in herself? She gives it to Xena so that Xena can battle the bad guy and save the day. Gabrielle does not take it for herself; she does not use it. Instead, she ignores and denies it. Gabrielle is run through the wringer in THE DELIVERER. All of this repression must take its toll eventually, and in THE DELIVERER (50/304) it is finally given to us in the most mythic proportions. From the moment Gabrielle says, "It hurts inside, Xena", we know that something is different this time. Hope, all of Gabrielle's darkness and fear, rips free of her mother with frightening speed, just as Athena sprang fully formed from Zeus' forehead. Gabrielle sees her as a part of herself, a baby to be cared for and nurtured, just as we should all pay attention to newly discovered aspects of ourselves. Xena sees Hope as evil, and, whether the mechanics of the story illustrate this evil or not, it is Xena who denies Hope a good mother, for surely Gabrielle would have been the best of mothers. Just as Xena chooses to leave Solan and in doing so becomes the Dark Mother, so now she forces the same on Gabrielle, again denying her the chance to grow. The Dark Mother figure is familiar territory to the people who make the show because it is the driving force behind the myths of Hercules. Hera is the archetype of the "wicked stepmother". She denies the hero a chance to grow by denying him knowledge of herself and therefore knowledge of his own inferior functions. To understand this you have to accept that all of the characters in a myth are parts of the same psyche, so the evil stepmother or father is the hero's own Anima or Animus. The hero does not have to be male for this to work, as the Grimm brothers show us in "Cinderella". The Dark Mother provides physical existence or life, but nothing more. The Good Mother provides for spiritual growth as well. Obviously Xena's equivalents are Lao Ma and Alti. I will not go any further into this because it becomes an essay all on its own. I would, however, like to touch on the idea of the Dark Eve. A clearly defined malevolent female archetype is missing from modern Western culture, and it is this lack of fear of the feminine dark side which leads to a lack of respect for what are considered feminine values. The consequences of ignoring such values are not seen as severe, if they are seen at all. In the ancient world Hera, Athena, and Artemis all had their wrathful sides, and Medusa was the pure embodiment of this idea. So where are we now? Gabrielle has been given tangible evidence of her darker self, and Xena is going off to Ch'in to kill someone against all of Gabrielle's urgings. What we have here is a failure to communicate. The lines are about to be drawn. The two halves of the whole (Xena and Gabrielle as one psyche) will battle for supremacy in a fight that, should either one of them actually win, will destroy them both. Gabrielle betrays Xena out of spite and anger, and then is terrified by her own actions and begs for forgiveness. Xena does not truly forgive her, but at the moment of her near execution, she reaches a place of calm that literally allows her freedom [ THE DEBT 52,53/306,307]. This short-lived and uneasy truce is shattered when Hope kills Solan, and, in turn, Gabrielle kills Hope. Once again Xena's worst fear has been touched by someone she trusts. "I trusted you. I trusted you and you lied to me!" This is the defining moment for the new Gabrielle. She now understands that dark actions are sometimes necessary, and, by the end of THE BITTER SUITE (58/312), Xena has given a full blown apology, in song no less, for all the pain she has caused. Each side has embraced and seen the worth of the other, but the struggle is never complete. The final shot of FORGIVEN (60/314) lets us know, none too subtly, that Xena still feels guilty. Gabrielle still struggles with the necessity of dark actions for the sake of the greater good in WHEN IN ROME... (62/316), but she is learning. In FORGET ME NOT (63/317) Gabrielle confronts her shadow side in its perfect guise of Ares, and all the way through he drops her hints. Her shadow is seeking what she is seeking: balance in a world turned on its head by fear. So, do we have this balance yet? Have the two characters perfectly blended into each other? For the sake of keeping the story going, they cannot, and here is where we get the big problem. Where do they go now? If the story does not end, the writers have to start recycling ideas, and they have already started. Xena has another "double". Callisto is dead, again, presumably for the last time, may her thoughts be empty. Gabrielle is dead, again, presumably not for the last time. Xena has journeyed to the land of the dead, again. Gabrielle and Najara bond in CRUSADER. So where do we go from here? Najara presents some interesting possibilities ala Joan of Ark. She is willing to "be good" at any cost. Gabrielle could learn something from her, but I suspect she already learned it in Ch'in. Xena could also learn something from Najara, but I suspect she will not. Okay, you have come this far with me, and I had like to say, "Thank you," for sticking around. I give you the option to bail out now because that line down there, you see it? It is the proverbial edge, and I am about to dive head first off of it. If you read on you will be coming with me. You have been warned. Why Is The Show So Popular? Think big now, not small. Yes, the writing is good and occasionally spectacular. Yes, the characters and the actors who play them are engaging. But why are characters like Xena, Sarah Conner, and Buffy, the Vampire Slayer so popular now? In the fifties Sheena: Queen Of The Jungle (TV, 1955) had her own show, but almost no one remembers her. Truly successful stories like the Herculean legends, Romeo And Juliet , Huckleberry Finn , or Star Wars (George Lucas, 1977) are remembered and cherished because they speak to things buried deep in us all - things not just at the individual level, but at the cultural level. It relates back to that absence of a dark female archetype in Western culture I was talking about earlier. Sun Heroes had a tremendous resurgence of popularity in the Renaissance because every culture in Europe was going through what the men in those stories went through. People were going from Aristotle's world view where "Life is a veil of tears" to what we now call "common sense", the revolutionary idea that everything is explainable and knowable if you would only use logic to look at it. We have come a very long way since then, and many people feel that we have lost something along the way - much like Xena. European culture tried to conquer the world, and the results were long and bloody conflicts - much like Xena. Western culture now feels ashamed of its past and much of the world vilifies it - much like Xena. In these ways, Xena is an allegory of the culture she was created to entertain. I believe that Western culture is about to undergo another very large, yet subtle change. This time the results will not be planes, trains, and automobiles, but something much closer to the heart of the culture, something spiritual, if you will. The Sun Hero was the archetype of the Renaissance, but his mission is only half done. At a cultural level we have conquered the logical conscious world, and now we must face our unconscious. Xena is a "Moon Heroine" (I wonder if I have coined a phrase? ), the exact opposite of a Sun Hero. As Western culture shifts towards the intuitive again, away from the logical, Xena is a new archetype. "With shattered legs and crippled soul, I went East". Dictionary Of Symbols by Tom Chetwynd. Published by Aquarian. Four Ages Of Man by Jay Macpherson. Published by MacMillan. Deeds Of Gods And Heroes by David Creighton. Published by MacMillan. I am just some Xenite like the rest of you. Like most of you I have a page and like some of you I am owned by two cats; Charles and Biscuit.